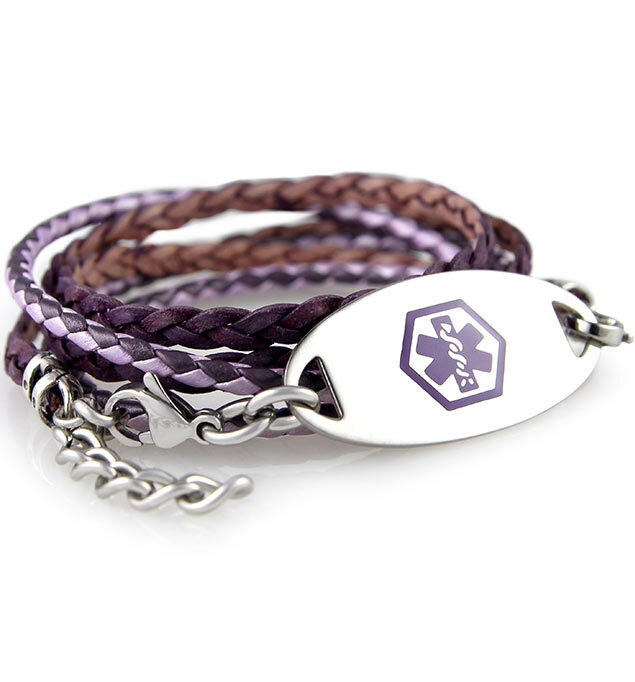 Under Wraps is a dual-strand, wrap-style, leather medical ID bracelet in coordinating lavender and deep plum colors. All of our wrap bracelets feature a custom-engravable medical ID tag so you can wear it just the way you like! On-trend, comfortable, and durable, Under Wraps is a fun twist on wraps and medical ID bracelets alike! This purple medical ID bracelet features an ID tag, alerting first responders to your custom-engraved medical information on the back. Our medical ID wraps are ideal choices whether you’re shopping for yourself or for a gift for someone with diabetes, epilepsy, lupus, food allergies, Von Willebrand’s, or any other chronic medical condition.